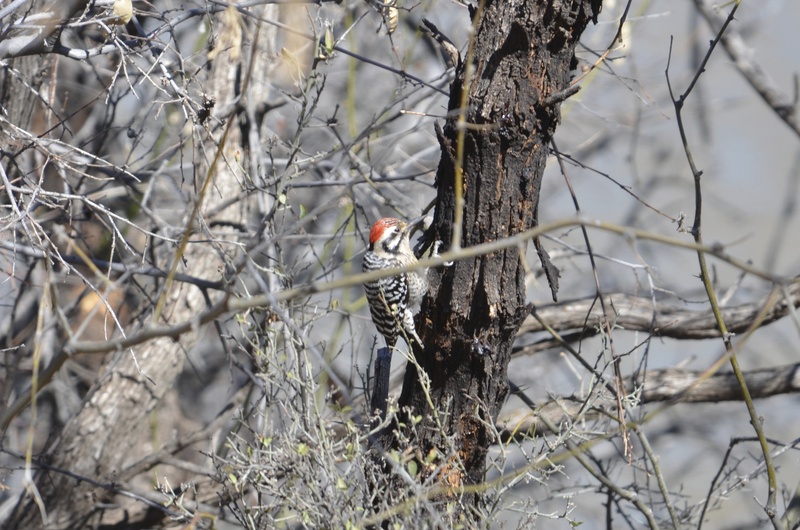 Of course, we knew it wasn’t the best time of year to go birding in Southeast Arizona. That would be during Spring migration, natch. 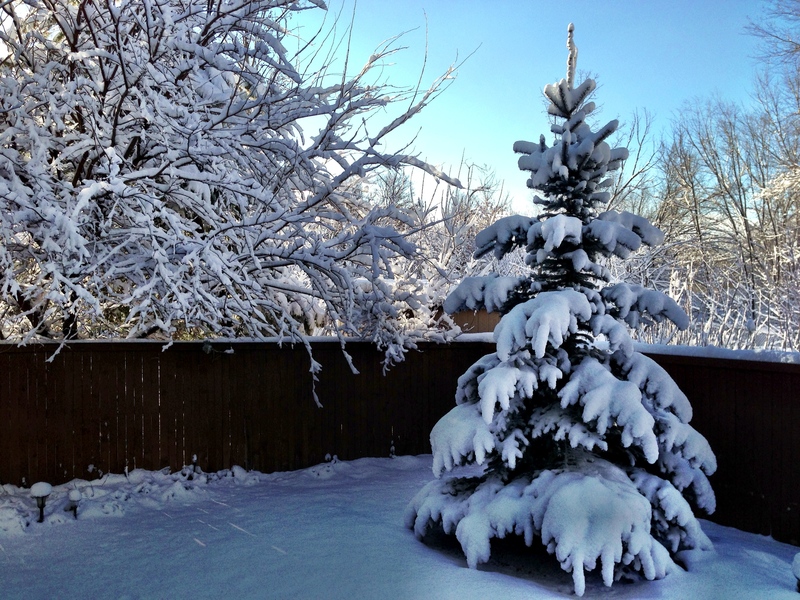 But this is what it looks like in Salt Lake City (where I live) and it’s pretty much the same in Calgary (where Steve lives). Ugh. Already tired of winter. And it’s only February. Blue skies. Warm temperatures. No snow. Yes, I’ll have some. So, here’s the trip we took. We flew into Phoenix and then headed southeast. Easy peasy. Most people have a goal or target bird when they go on a birding trip. My goal was to start using my brand new camera (Nikon D7000) and new 200mm lens and new 2x teleconverter. That’s a lot of new for someone who is not a great photographer, as I’ve admitted before (and you’ve seen) on this site. I confess to shooting mostly on Auto (yes, I hear your gasps) and I know very little about light, except that I do know that shooting into the sun produces lousy results. My New Year’s Resolution this year is to get out of shooting on Auto and though this trip didn’t change that, I am determined to change my novice practices and start getting better results. I start yet another photography class next weekend. Our first day out took us to the Sod Farms at the Santa Cruz Flats and it was a wonderful bird day, though a disappointing photography day. Our purpose was to find the Mountain Plover, which would be a lifer for me. Sod Farms, I must admit, are a first for me too. There we were, driving up and down big squares of sod fields looking for the Plovers. We had stopped so Steve could scan the area with his binoculars when a car pulled up and the usual birder exchange of “Seen any Plovers?” was tossed about. “No,” on both sides. The van drove on. We stayed a few minutes longer and then another car pulled up. 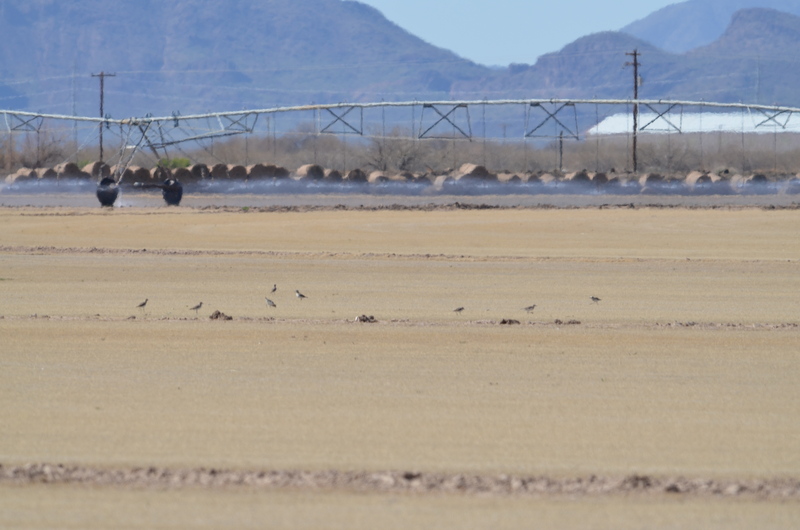 “Seen any Plovers?” I was beginning to sense this was going to be a bust at the sod farms today. That car drove on too and we decided to move on as well. As we turned around another big square of a sod field the people in the first car were pulled to the side with their scope out. Voila! Mountain Plovers! We found them, yes, but they were still quite a bit in the distance. Steve counted 62. Me? I got this lousy shot of a group of them. A lousy shot of Mountain Plovers in the distance. So far, I’m impressed with my new 200mm lens that just came out from Nikon—the optics are great—but not so impressed with the teleconverter. The 2x teleconverter produces crummy images at a distance, making it difficult to focus. This whole day was frustrating for me and I was wondering if I had just sunk a ton of money down the toilet. Or if it’s just plain user error. (The latter most likely.) I was beginning to think I could make my Twitterpal, @TheIneptBirder feel pretty good about himself. The following day at Patagonia Lake State Park I had much better luck with the camera and lens. It was a beautiful day with 75° F temps and we were able to enjoy the warmth, the clear blue skies, and of course find some wonderful birds. Still struggling with the lens and its teleconverter, but doing much better with birds that are closer. 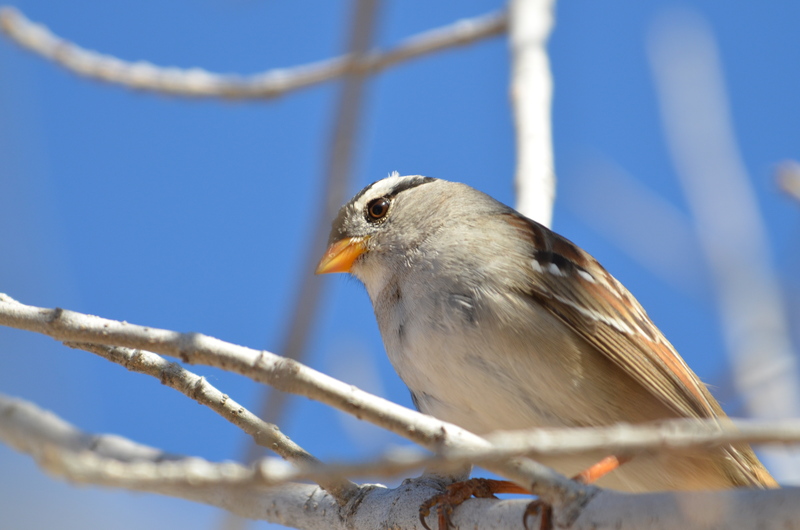 White-crowned Sparrow. If only he wasn’t hiding behind all those branches. Bridled Titmouse–A lifer for both Steve and me! I absolutely adored Patagonia Lake State Park. I loved all the big campers parked at their campsites right at the entrance. Several of them had bird feeders they put out themselves and I imagined that Steve and I could one day buy a camper and head on down to Patagonia Lake and hang out during the winter and just look for birds. And be old together. And have s’mores. Next post will have more on our adventures in Southeast Arizona. Promise and cross my heart. There might even be better photos. ps: I returned the 2x teleconverter and ordered a 1.7x, which from the reviews I’ve read online is much better. Let’s just hope. 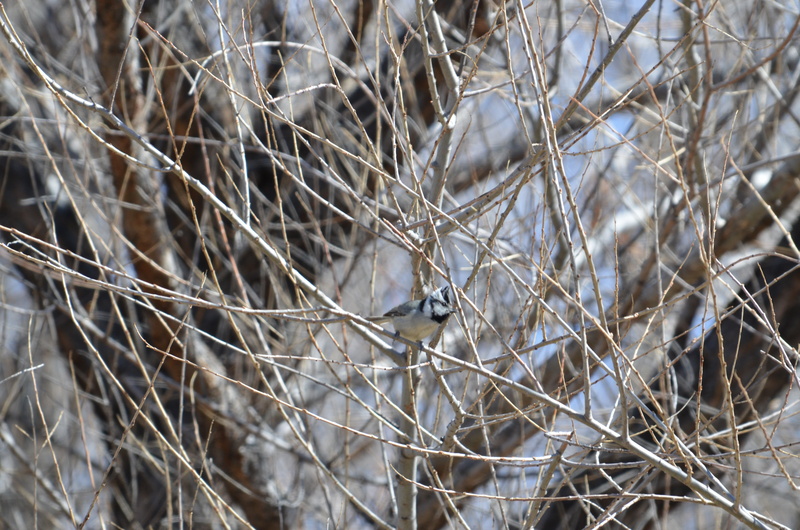 Didn’t you love the bridled titmouse?! We think he’s the punker titmouse. 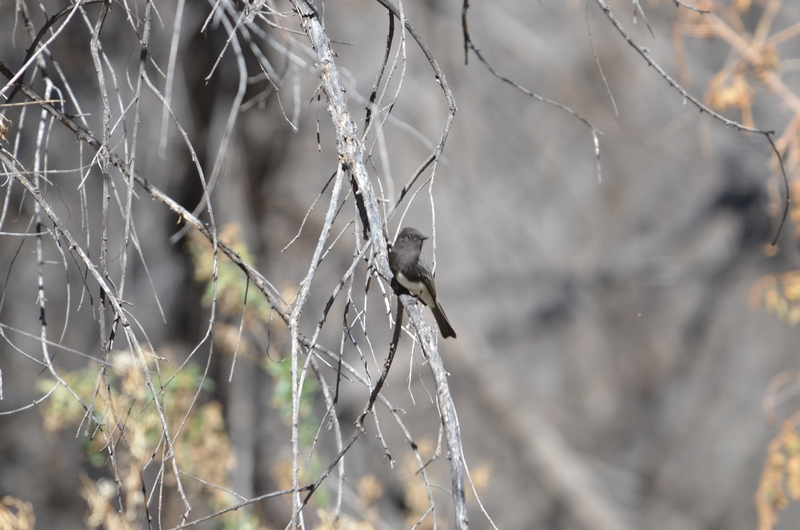 Just loved that bird when we were in AZ. Nice Lisa! You’re too kind in your intro I think, that Laurence guy is kind of a flake, but even so it looks like y’all had some great success! Mountain Plover is a sweet bird, and one that is, unfortunately, declining, so ya never know when you may get another chance. Patagonia is one of my all time favorite spots. It’s best in the spring of course, but it terms of diversity and scenery it’s tops. I’m really sorry I missed the Flats with you all. 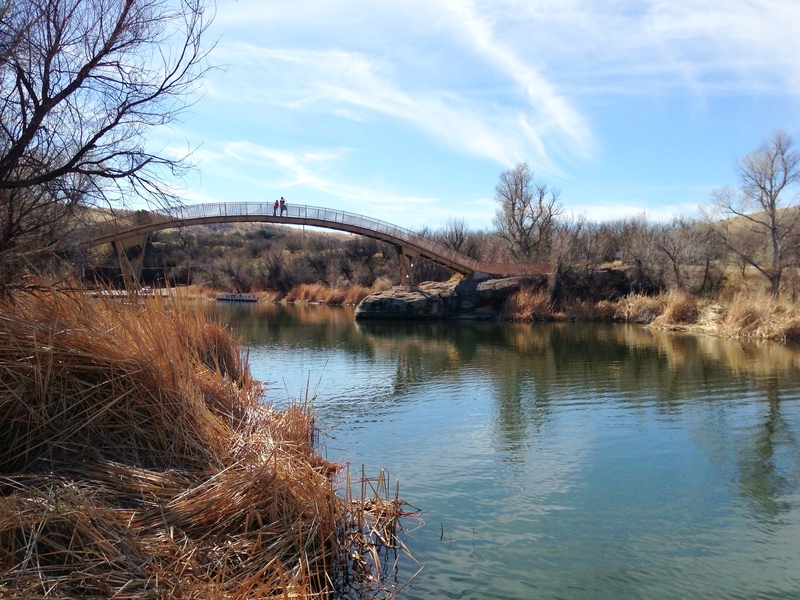 I tried fro some consolation birding while in Iowa, but it did not match up to an afternoon at the Santa Cruz flats with y’all. On a side-note, I think the 1.7 teleconverter was a good call. From what I’ve read/heard, those 2x teleconverters are only optimal on the really big $10k rigs, otherwise they just take away too much much light and image quality. Great write up. Looking forward to the rest! Laurence, thanks for dropping it! You can count on us getting down to Phoenix and Tucson again, so we’ll have to try to connect again. And maybe I’ll have better luck with my photo gear. We will be down there in a few weeks-so hope things will be warmer. 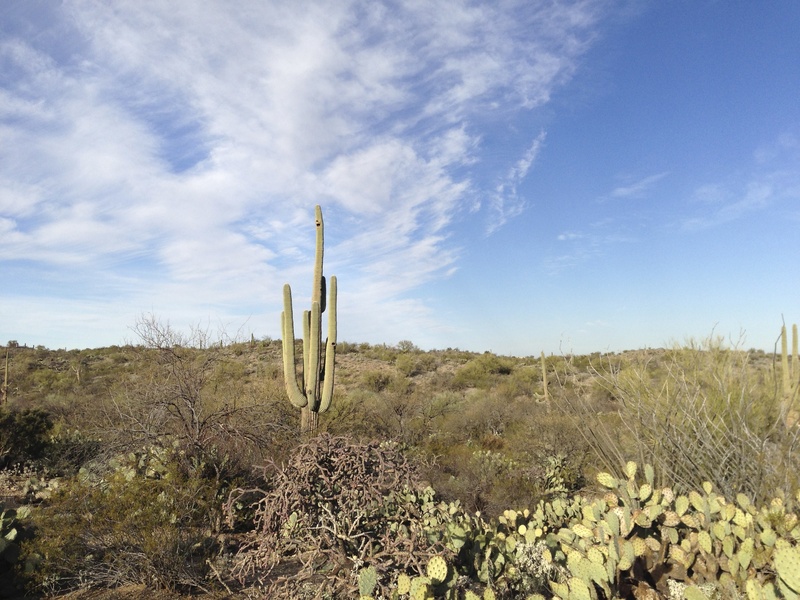 We will be seeing some similar sites, but also doing a little hiking in the Catalinas, Sonora Park or the Tortilitas, (My mom lives in Oro Valley). Looking forward to some good Mexican food too! Doug, I didn’t realize your mom lives in Oro Valley. That is great! If we don’t retire in Panama, right now Tucson is my second choice. (It used to be #1 until we visited Panama last year and that changed everything.) I love the area around Tucson and wouldn’t miss the snow at all! (Though I heard that Tucson got dumped on with snow a couple days after we returned.) Enjoy the great Mexican food!